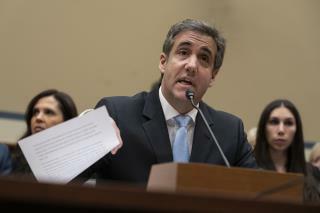 (Newser) – Michael Cohen turned over documents to the House intelligence committee on Wednesday that show edits to a false written statement he gave to the panel in 2017 about a Trump real estate project in Moscow, the AP reports. Cohen provided the documents in a closed-door interview with the panel, according to two people familiar with the documents who spoke on condition of anonymity to discuss the confidential meeting. It is Cohen's fourth day of testimony on Capitol Hill as he prepares for a three-year prison sentence for lying to Congress and other charges. Cohen acknowledged in a guilty plea last year that he misled lawmakers by saying he had abandoned the project in January 2016 when he pursued it for months after that as Trump campaigned for the presidency. "It's unclear who edited the documents or what exactly was changed." Cohen, convicted felon for lying among other things, probably "edited" the document himself and is now blaming President Trump's other lawyers like a jilted woman scorned. Atlantic City casinos and NYC real estate was partially run by the Mafia. Trump was the front man with a brand of gold. Most of his partners went to jail or are now dead. Digging up his past business dealings will take a thousand investigators.